Here at TravGear we’ve seen a lot of so-called solar charger, which sound great in theory, but fail to deliver much – if any charge where and when it’s needed. Solartab changes all of that. Solartab measures 234x1605mm and weighs a hefty 762g, but there is a reason for it’s not-very-handy-for-travel design. Basically a 5.5W solar panel that refuels a 13,000 mAh battery, Solartab can also be recharged the ‘usual’ way using a microUSB slot, so you can take it to your first destination fully charged. It’s also the perfect design to tuck into a laptop bag or carry-on bag, so could act as a charging station for long-haul journeys. Make no mistake; 13,000mAh is a BIG battery, good for recharging a smartphones at least six times, and a tablet about three times. Equipped with two USBs (both 2.1-amp-rated, so good for tablets) for recharging of two devices at once – nice – Solartab has a handy solar charging indicator so you know when it’s working. So the key question becomes this; how long does Solartab take to fill-up its battery once left out in the sun? The answer to that is massively weather-dependent, and it’s also all about angles. 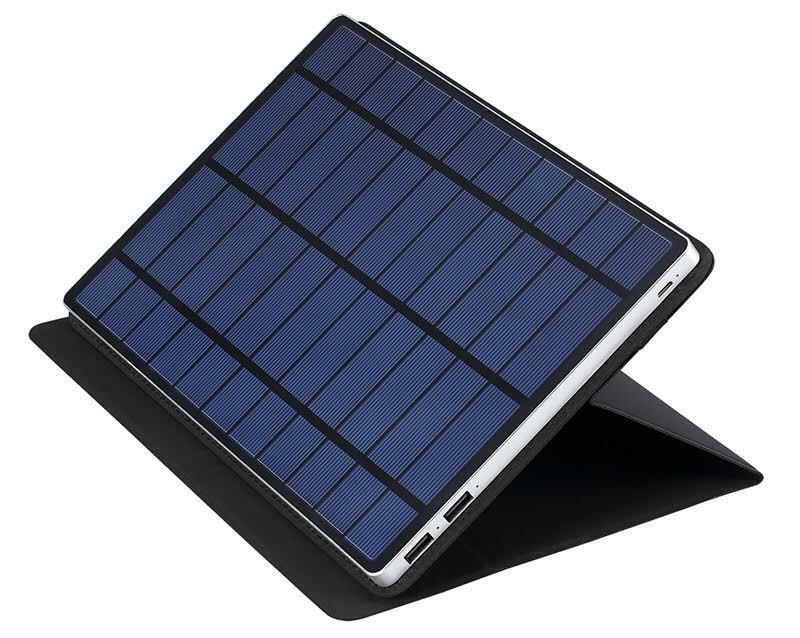 Get the Solartab facing a blazing Sun (using its adjustable iPad-like case) and its battery fills in about 12 hours. That’s a long time, but bear in mind that will then refuel a phone for about a week. It’s even possible to charge-up a device as the Sun hits the solar panels. Best thought of as a backup battery that recharges itself if left outside around camp, or on a window sill and used as part of daily life, Solartab is an immensely useful, high-performance device that’s hugely impressive.